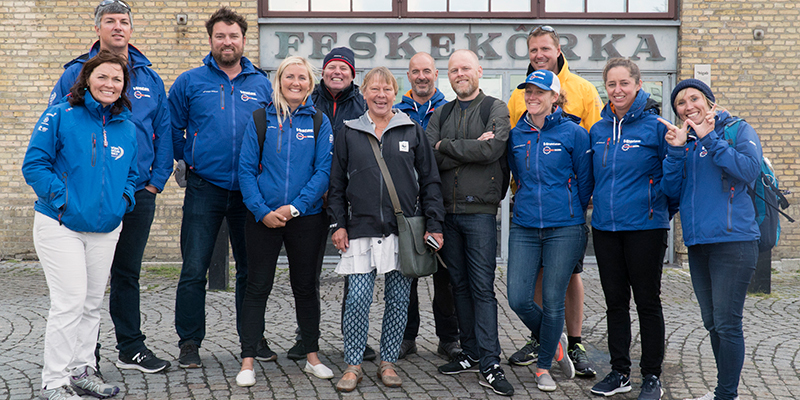 Just before heading back out to sea for the final leg to The Hague, Vestas 11th Hour Racing sailors spent the morning with staff from the WWF Sweden in the iconic and busy Götenborgs Fisheauktion and Feskekôrka market (‘fish church’ in Swedish), learning about the fish that swim beneath their hulls. The team met with the organization not only to learn about the benefits of catching and farming seafood in a sustainable manner but also to highlight how easy it can be for everyone to purchase seafood that is sourced responsibly. WWF Sweden experts demonstrated the use of WWF’s Sustainable Seafood Guide app for the country of Sweden as the team wandered around the bustling fish market learning about local fish and traditional Swedish seafood delicacies. 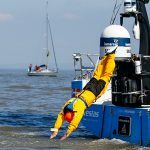 Today marked the second to last grant that 11th Hour Racing has awarded at each stopover of this edition of the Volvo Ocean Race through its legacy project with Vestas 11th Hour Racing. The majority of fish stocks around the world are overfished – since 1950, there has been a 90% drop in numbers of the ocean’s large predatory fishes – the kind that humans generally prefer to eat, such as salmon, tuna, and swordfish. And depending on the way fish are caught, critical habitat is often destroyed taking years to recover, and unwanted fish species or even dolphins and sea turtles are trapped in nets and killed, and discarded mostly dead as bycatch. “We would like it to be as easy as possible for consumers to make more sustainable choices. This is why we developed the sustainable seafood guide, a mobile app that helps consumers make more conscious choices when it comes to fish. The guide is also adapted to local conditions. 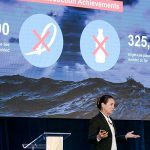 This means it is possible to download the app and choose sustainable seafood that protects the waters you just sailed through”, – Inger Näslund, Senior expert marine and fisheries, WWF Sweden. Like the market that the sailors visited today in Gothenburg, many restaurants, fish markets, and fish auctions are getting certified as providers of sustainable seafood, making the purchase of sustainable seafood even easier. Use a sustainable seafood guide. You can find all of WWF’s guides listed by country by clicking here. For the US guide, WWF recommend their partners at Seafood Watch. Support markets and restaurants that have committed to only serving sustainable seafood. Ask where your fish or shellfish came from and how it was caught or farmed. At each Volvo Ocean Race stopover, Vestas 11th Hour Racing meets with a local non-profit to learn about their environmental work. 11th Hour Racing awards a $10,000 grant to the organization as part of their mission to leave a legacy beyond the race. Some of the previous grant recipients include: Asociación De Naturalistas Del Sureste, Spain; Take 3, Australia; and Save The Bay, United States; Click here to view all grant recipients of this project.